Ties between the Bush and Bin Laden families. The Bush and Bin Laden families have had relations for over 20 years. Osama says HE HAD NOTHING TO DO WITH THE ATTACKS OF 9/11! - Here is the transcript of what you were not allowed to hear from Osama binLaden's own mouth: - Not many people know that, after September 11, 2001, Osama bin Laden issued a statement on tape that he had nothing to do with the attacks on America and that such actions were against the teachings of Islam. Americans were prevented from accessing this information because we were told that Osama could possibly have an embedded "secret code" in the tape that would alert other terrorists cells to "activate" and target other American cities. - Osama bin Laden: "I was not involved in the September 11 attacks in the United States nor did I have knowledge of the attacks. There exists a government within a government within the United States. The United States should try to trace the perpetrators of these attacks within itself; to the people who want to make the present century a century of conflict between Islam and Christianity. That secret government must be asked as to who carried out the attacks. ... The American system is totally in control of the Jews, whose first priority is Israel, not the United States." FBI Bin Laden Not Wanted 'Dead or Alive' for 9-11 - FBI Director Robert Mueller, in a speech at the Commonwealth Club on April 19, 2002, said: "In our investigation, we have not uncovered a single piece of paper - either here in the United States, or in the treasure trove of information that has turned up in Afghanistan and elsewhere - that mentioned any aspect of the September 11 plot." - The evidence against Bin Laden, promised by Secretary of State Colin Powell on September 23, 2001, has yet to be made available to the public. CIA: Osama Helped Bush in '04 - On Oct. 29, 2004, just four days before the U.S. presidential election, al-Qaeda leader Osama bin-Laden released a videotape denouncing George W. Bush. Some Bush supporters quickly spun the diatribe as “Osama’s endorsement of John Kerry.” But behind the walls of the CIA, analysts had concluded the opposite: that bin-Laden was trying to help Bush gain a second term. - This stunning CIA disclosure is tucked away in a brief passage near the end of Ron Suskind’s The One Percent Doctrine, which draws heavily from CIA insiders. CIA closes down unit that was hunting Bin Laden - The terrorist tracking unit, known inside the spy agency as "Alec station," was disbanded late last year and its analysts reassigned to other offices within the CIA's Counterterrorist Center, the officials said. - TVNL COMMENT: Any Questions? Bush had no intentions of getting his buddy. FBI’s Top Al Quaeda Expert Resigns - Dies on 9/11 at his New Job; Head of Security for the WTC. Who was Sitting on the FBI? U.S. put off Predator flights over Afghanistan despite initial successes - As late as a week before the suicide attacks against New York and Washington, senior administration officials meeting at the White House had not yet resolved questions about plans to equip each Predator with as many as two Hellfire missiles to kill bin Laden, these officials told The Associated Press. - This came despite the remarkable successes in the fall 2000, including what many intelligence experts concluded were three separate sightings of bin Laden during a series of 11 Predator flights over the Afghan desert. - TVNL comment: They could have tried to get Bin Laden before 9/11 but the Bush/PNAC White House delayed action. Bin Laden family fled United States - Two dozen members of Osama bin Laden's family were urgently evacuated from the United States in the first days following the terrorist attacks on New York and Washington, according to the Saudi ambassador to Washington. - TVNL comment: This took place when the airlines were gounded. Officials: Drones spotted Osama - Though Predator drones spotted Osama bin Laden as many as three times in late 2000, the U.S. administration did not fly the unmanned planes over Afghanistan during its first eight months and was still refining a plan to use one armed with missiles to kill the al-Qaida leader when Sept. 11 unfolded, current and former U.S. officials say. - TVNL comment: Bush/PNAC had him in their sights 3 times and they did nothing! Al Qaeda mutating like a virus - Terror networks operating with renewed vigour- Iraq war helping bin Laden recruit suicide bombers. - Part of the problem, analysts say, was the war in Iraq, which unsurprisingly created a new wave of animosity toward the United States and Britain, acting as an effective recruiting tool among disaffected Muslims. - TVNL comment: We told you so! We all told you so! 16 Words and 28 Pages - Each year, Project Censored lists the top 25 stories ignored by the mainstream media. Their 2003 release, which chronicled overlooked news items from 2001-2002, ranked the Bush administration's role in thwarting pre-Sept.11 terrorist investigations at No. 4. "Bush Administration Hampered FBI Investigation into Bin Laden Family Before 9/11," [LINK], they announced, using scattered news reports and former FBI deputy director John O'Neill's testimony to back claims that the government obstructed terrorism investigations and placed oil concerns above citizens' safety. "The main obstacles to investigating Islamic terrorism were US oil corporate interests and the role played by Saudi Arabia in it," O'Neill told French intelligence analysts Jean-Charles Brisard and Guillaume Dasquie. Bush made Osama deal with Musharraf - Pakistan President Pervez Musharraf has struck a deal with the US not to capture Osama Bin Laden, fearing this could lead to unrest in Pakistan, according to a special investigation by The Guardian. Inside story of the hunt for Bin Laden - For the Americans, the March operation was yet another bitter lesson in the difficulty of tracking down Bin Laden. With the US election nearing and mounting concerns about Washington's second great military project - Iraq - George Bush more than ever needs the incalculable political boost that Bin Laden's capture would bring. - TVNL Comment: Mark this down, Bin Laden will be captured or lkilled during the weeks preceeding the 2004 election. This will be a strategic maneuver to boost Bush’s popularity prior to the election. Did Our President Spike The Investigation Of Bin Laden? - After Bush took office, he said, "there was a major policy shift" at the National Security Agency. Investigators were ordered to "back off" from any inquiries into Saudi Arabian financing of terror networks, especially if they touched on Saudi royals and their retainers. That put the bin Ladens, a family worth a reported $12 billion and a virtual arm of the Saudi royal household, off-limits for investigation. Bin Laden family's US exit 'approved' - THE United States allowed members of Osama bin Laden’s family to jet out of the US in the immediate aftermath of September 11, even as American airspace was closed. - Former White House counter-terrorism tsar Richard Clarke said the Bush administration sanctioned the repatriation of about 140 high-ranking Saudi Arabians, including relatives of the al-Qaida chief. George of Arabia - The unholy alliance between the Bushes and the Saudis - By Michael Moore - To make matters worse, it turned out that one of bin Laden's brothers -- Shafiq -- was actually at a Carlyle Group business conference in Washington, D.C. the morning of September 11th. - Mr. Bush, the bin Ladens are not the only Saudis with whom you and your family have a close personal relationship. The entire royal family seems to be indebted to you -- or is it the other way around? Strange Bedfellows: - US Contractor in Iraq Helped Fund Al Qaeda - One reason the Bush Administration gave for going to war in Iraq was Saddam Hussein's alleged ties to terrorists. So it is ironic that one of the partners in a big Iraqi firm being used by US contractors in Iraq is also a founding partner in an organization that's been identified as helping fund Al Qaeda. Bechtel tied to bin Ladens - Osama bin Laden family members invested $10M in an equity fund run by former Bechtel unit. - The Bush administration launched a war on terror because of the alleged acts of Osama bin Laden. Ironically, one of the companies the administration has picked to rebuild Iraq after the latest phase of that war has ties to bin Laden's family, according to a published report. Bush took FBI agents off Laden family trail - The report, which the BBC claimed was based on a secret FBI document, numbered 199I WF213589 and emanating out of the FBI’s Washington field office, alleged that the cynicism of the American establishment and "connections between the CIA and Saudi Arabia and the Bush men and bin Ladens" may have been the real cause of the deaths of thousands in the World Trade Centre attacks. 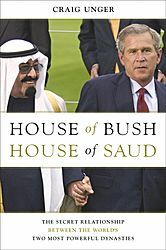 - Newsnight said there was a long history of "shadowy" American connections with Saudi Arabia, not least the two presidents Bush’s "business dealings" with the bin Ladens and another more insidious link revealed by the former head of the American visa section in Jeddah. Waxman looking for ‘reassurance’ - Congressman asks for probe of flights of bin Laden kin - California Democrat Henry Waxman is calling on Attorney General John Ashcroft to reveal who cleared members of Osama bin Laden’s family and other Saudi citizens to leave the country immediately following the Sept. 11 terrorist attacks. White House, 4/01: Focus on Bin Laden "A Mistake" - A previously forgotten report from April 2001 (four months before 9/11) shows that the Bush Administration officially declared it "a mistake" to focus "so much energy on Osama bin Laden." The report directly contradicts the White House's continued assertion that fighting terrorism was its "top priority" before the 9/11 attacks1. - Specifically, on April 30, 2001, CNN reported that the Bush Administration's release of the government's annual terrorism report contained a serious change: "there was no extensive mention of alleged terrorist mastermind Osama bin Laden" as there had been in previous years. When asked why the Administration had reduced the focus, "a senior Bush State Department official told CNN the U.S. government made a mistake in focusing so much energy on bin Laden." Terrorist's Name On Manifest Raises Questions About Saudi Flights After 9/11 - List and testimony indicates FBI may have allowed alleged hijacker's kin to leave U.S. with son of Saudi defense minister without questioning them. A copy of a previously unpublished manifest, obtained late Thursday night and dated September 15, 2001, provides evidence of a private Boeing-727 Saudi flight from Lexington, Kentucky to London. But the names on the manifest raise serious questions about FBI policies and procedures related to witness identification, criminal investigations and obstruction of justice. Summary of Saudi Arabia Flight Findings - No commercial planes, including chartered flights, were permitted to fly into, out of, or within the United States until Sept. 13, 2001. After the air space reopened, six chartered flights with 142 people, mostly Saudi Arabian nationals, departed from the United States between Sept. 14 and 24. One flight, the so-called bin Ladin flight, departed the United States on Sept. 20 with 26 passengers, most of them relatives of Osama Bin Ladin. TIA now verifies flight of Saudis - For nearly three years, White House, aviation and law enforcement officials have insisted the flight never took place and have denied published reports and widespread Internet speculation about its purpose. - But now, at the request of the National Commission on Terrorist Attacks, TIA officials have confirmed that the flight did take place and have supplied details. - TVNL Comment Notice that they admit this just weeks before the new Michael Moore movie Fahrenheit 9/11 is released exposing this. CIA Commander: We Let bin Laden Slip Away - But in a forthcoming book, the CIA field commander for the agency's Jawbreaker team at Tora Bora, Gary Berntsen, says he and other U.S. commanders did know that bin Laden was among the hundreds of fleeing Qaeda and Taliban members. Berntsen says he had definitive intelligence that bin Laden was holed up at Tora Bora—intelligence operatives had tracked him—and could have been caught.